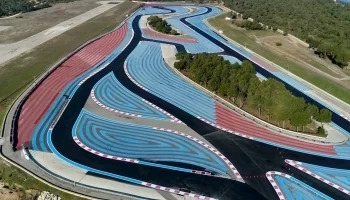 The circuit Paul-Ricard or circuit of the Castellet, is a motor racing circuit French located in the department of Var near the common Signs and Castellet. The circuit was born in 1970 under the leadership of Paul Ricard with the advice of Jean-Pierre Beltoise and a few other experts in motor sport. Designated the First Center of Excellence by the FIA institute for motor sport safety, 2005, homologated by the FIA in 2006, the circuit has re-opened its doors to the public in 2009 and now hosts events motor racing and bike, as well as runs a number of clubs and marketing operations. The path, of oblong form, is characterized by the long straight line of the Mistral. Long (1.8 km), it can be altered by the chicane north was built in 1986. Another feature of the trail is its flatness of the fact of its construction on a platter. Thus, its altitude varies from 408 to 441 meters. The length of the path in its configuration F1 is 5,861 km ; this is the longest configuration of the circuit, the shorter it 826 m. The circuit has a total of 167 possible configuration. This number rare and high combinations can be explained by the fact that the circuit is very often used for tests ; tests which are favoured by the climate, especially in winter where it is mild. Note that the route of 3.8 km is most often used for tests of single-seaters. 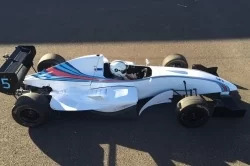 Finally, one of the traits treated as part of the circuit is its areas of asphalt covered with strips of abrasive surface of the colours blue and red. They are made up of a mixture of asphalt and tungsten, and offer levels of abrasiveness different. Barriers Tecpro are placed at the end of these areas of clearances, in place of the usual rows of tyres on the other circuits permanent.